Darren Aronofsky has definitely got a cinematic vision all his own. A strange artistic style, a penchant for the dark side, a no holds-barred approach to film. His movies are perhaps the most polarizing out there, you either love ’em or you hate ’em. Pi & The Fountain; hated. Requiem, The Wrestler, & Black Swan; loved. It’s hard to land somewhere in the middle when watching an Aronofsky picture, his uniqueness just doesn’t lend itself to mediocrity. And so when I heard that he would be presenting us with his take on the classic Bible story, I assumed that once again most people would think it the best or worst movie ever. My bet was on worst. 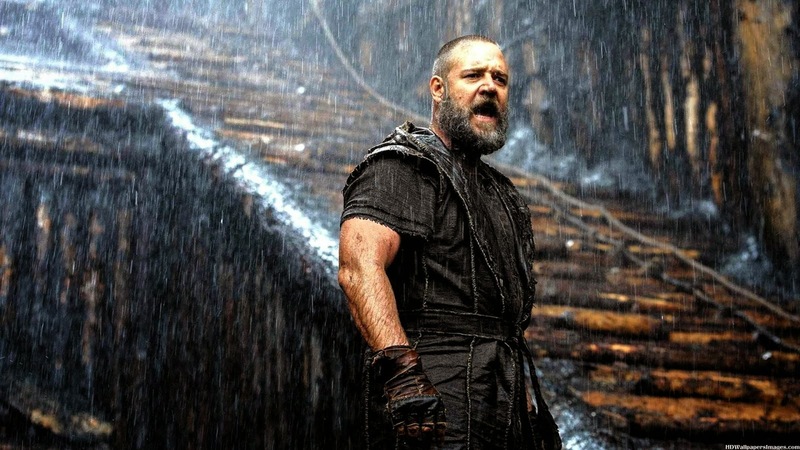 I mean, Russell Crowe as Noah and a battle between two peoples for possession of the Ark? Sounded weird to me, but then again when has an Aronofsky film not been weird? Earth is not a very nice place to live for Noah & his family. Many generations ago Adam & Eve were evicted from paradise, choosing a life of knowledge over a live of peace. Of course their son Cain killed one of his brothers, but the other, Seth, survived. The young men went their separate ways; Cain toward a life of mastery & machines, Seth clinging on to the old ways. Noah is a direct descendant of Seth, keeping the faith in a world destroyed by the civilizations of mankind. But things are about to change. The Creator has given Noah a vision, advanced warning that soon the Earth will be covered in water, that every living thing will die so that He may begin anew. 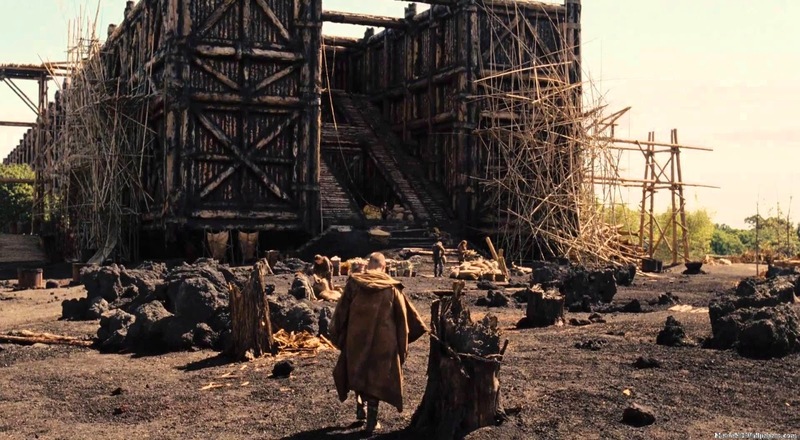 Noah & his family flee toward the mountain home of Methuselah, Noah’s grandfather, where they begin the storied building of the great boat, the housing of animals, and the preparation for the apocalypse. Others have seen the signs too though, evil men, refugees, those who will do anything to survive, and they want Noah’s Ark. A battle will ensue, not just between men, but inside the soul of Noah, as he is confronted with a choice between destroying all of humankind or becoming the savior of so very few. Let me be honest so that you’ll know where I stand, perhaps making it easier to decide for yourself how you’ll feel about this movie. I’m not a religious man. I was raised in the church, know my Bible front & back, think that Jesus had some great things to say, but see the lessons in the good book as just that; lessons, morals, a guide, not literal historic events. Coming from this perspective, I loved this take on the Noah story. What Aronofsky did here is pretty genius. He took the tale, understood that it was meant to teach us something, transferred that message to the big screen, and then crafted it into an entertaining epic that would capture our attention more than any Sunday school class ever did. It was like a fantasy version of the bare-bones story, what might have come about if Tolkien had chosen the Bible to base Middle Earth on and not Welsh myth. 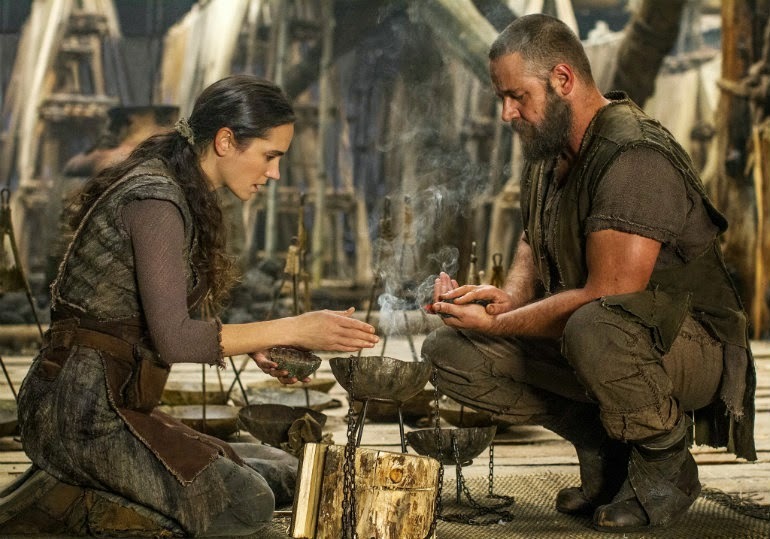 As someone who loves fantasy books, I loved the way this old story was told, with originality, excitement, a sprinkle of magic, raw emotion, despair, heartache, lust; aspects that are lacking from the Biblical version, can be imagined by pretty much anyone if they cared to try, but could only be delivered like this by one director. On the flip side, your every day religious conservative might not enjoy this movie as much as I did. It takes the outline of the plot from the Bible and then takes poetic license to fill in all the details. Not exactly leaving the Word of God alone, and basically turning scripture into pleasure. So you’ll have to figure out where you stand before you go into the theatre; it’ll probably determine how you receive this movie. But putting those considerations aside, let’s look at the film as a film. The direction I thought was amazing; great detail, cool vision, intense imagination. The acting I thought was just OK. Crowe is just not my favorite. I don’t hate him, but he’s always Russell Crowe, always dramatic, always muscular; it gets a little old. Connelly & Watson are beautiful beyond compare, but when called upon to be uber-emotional they just became whiny if anything. Winstone was good, Hopkins was good, and overall the film worked even beyond my approval of the direction the story was taken. I was ready to give Noah five stars until they got on the boat, the girls starting crying, and the pace fell considerably. But I still enjoyed it immensely, still loved the path it took, and would still recommend it as an incredibly original version of one of the Bible’s most well-known tales.